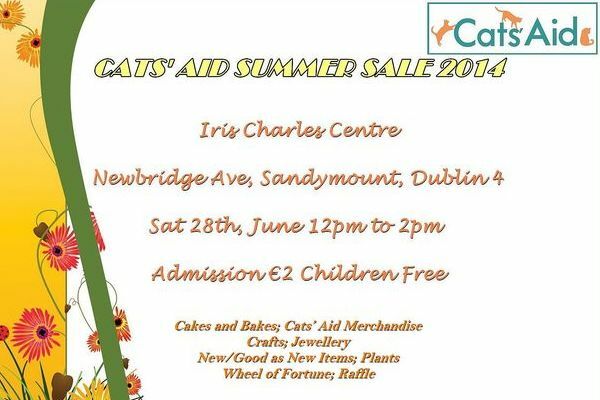 Join Cats’ Aid for their Summer Sale this weekend. As well as cakes and bakes, crafts, jewellery, plants, new and good-as-new items and Cats’ Aid merchandise, the event will also feature a Wheel of Fortune and a raffle. There will be plenty of activities for children and refreshments will be available on the day, including seasonal favourite strawberries and cream! Cats’ Aid is a charity which rescues cats in need. They provide health checks and arrange a place to live for strayed cats who would otherwise struggle to survive, as well as trapping, monitoring and spaying feral colonies. They also run a help line for people seeking advice about stray cats, as well as posting details of lost and found cats on their website. The sale runs from 12pm to 2pm this Saturday in the Iris Charles Centre on Newbridge Avenue in Sandymount. Admission is €2, with free entry for children. Any donations of cat food would be welcome.